At Lucas, we focus on the design and production of modern horizontal boring mills. 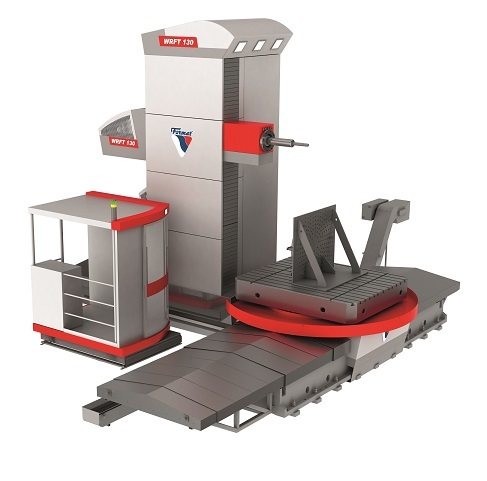 Our main machine models are two series of horizontal boring mills: WFT (Table Type) and WRF (Floor Type). We offer standardized models or models with custom features to suit production demands. Each machine can be equipped with a large number of accessories from a variety of world famous manufacturers. We are particularly proud of our headstocks and faceplates that have long been recognized by customers as some of the best on the market. We also have a cylindrical grinding machine in our product line. This small division of the Fermat Group Company has proven the quality and unique precision of its grinding machines in a very short time. CNC Rotary Table on Cross Roller Taper Bearing with 2 Pinions and 2 Servomotors, Maximum Table Load 44,092 lb, 70.9" x 86.6"
CNC Rotary Table on Cross Roller Taper Bearing with 2 Pinions and 2 Servomotors, Maximum Table Load 44,092 lb, 78.7" x 94.5"
Horizontal Boring Machine WRFT 130/150/160 CNC series is the largest table type horizontal borers produced by Fermat. 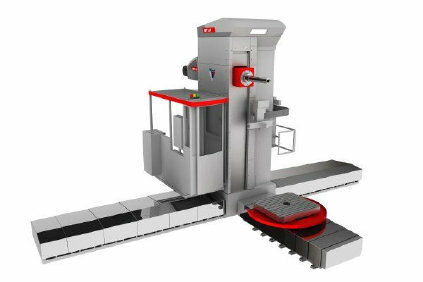 Among other machine characteristics, it has powerful milling and drilling capacity, even at the top of Y-axis stroke with higher precision than other machines available on the market. The powerful headstock consists of a movable slide ram (V-axis) and a moveable live spindle (W-axis). Given additional optional accessories, it is possible to increase the number of controlled axes. During the metal processing, the column of the machine provides a Z-axis movement and the work pieces are clamped on the rotary table that travels on the X-axis. The standard configuration provides linear ways for all axis slides. 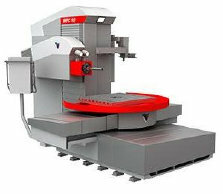 WRFT 130/150/160 CNC is a universal boring and milling machine that allows efficient processing of large and heavy work pieces while utilizing high precision and quality of operation. WRFT 130 CNC - Spindle Diameter 130 mm | 5.12"
WRFT 150 CNC - Spindle Diameter 150 mm | 5.91"
WRFT 160 CNC - Spindle Diameter 160 mm | 6.30"
Fermat’s WF 13 floor mill incorporates the newest technological advances available on the machine tool market place. The WF 13 is equipped with a powerful headstock capable of high axial forces for machining large or small work pieces alike. The additional CNC rotary table available on this model is capable of precise circular interpolation, and is a very useful tool. 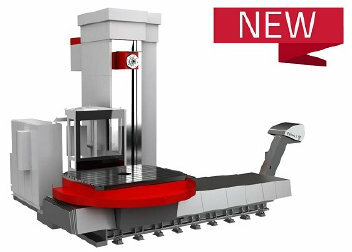 The WF 13 floor mill is designed for even the most problematic machining situations due to its rigid design, and the precise machining capabilities that it offers. 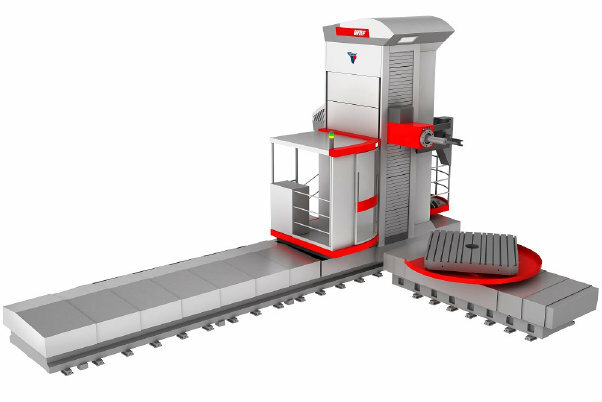 WF 13 CNC - Spindle Diameter 130mm | 5.12"
WF 13R CNC - With Traveling Ram 700mm | 27.60"
Horizontal Boring Mill WRF 130/150/160 CNC represents the newest concept and technology of floor-type horizontal boring mills currently on the global marketplace. 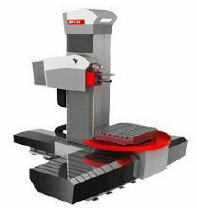 Its powerful headstock consists of a movable slide ram (Z-axis) and a moveable live spindle (W-axis). 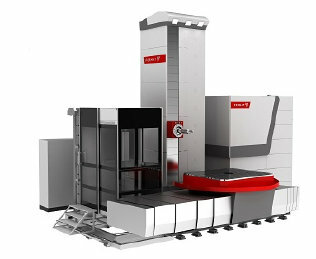 The Fermat WRF Machine has excellent circular interpolation accuracy and high precision of the additional CNC Rotary Table. The column travels in the X-axis from 2400 to 28 100 mm l 94.49" -1 106", headstock travel can be from 2 000 mm to 6 000mm l 78.74" – 236.22", and ram travel of: 900 mm to 1200 mm l 35.43"-74.24". We can tailor the machine to be suitable and specific for your production by the use of different and complimentary accessories. WRF 130 CNC - Spindle Diameter 130 mm | 5.12"
WRF 150 CNC - Spindle Diameter 150 mm | 5.91"
WRF 160 CNC - Spindle Diameter 160 mm | 6.30"
WRF 160 Heavy- is an extremely sturdy execution of our floor type boring mill with a ram stroke of 1500 mm l 69.06", a spindle stroke of 1 000 mm l 39.37”, and a 160 mm l 6.30" spindle diameter representing the newest concept and technologies available for floor-type horizontal boring mills currently available on the global marketplace. WRF 160 has excellent accuracy of circular interpolation and a very precise design of the additional CNC Rotary Table with a maximum load up to 80 000 kg l 176 370 lb., even heavier work pieces can be clamped on floor plates or specially designed tables. WRF 160 is designed with a Cross-Ribbed fabricated Column. There are two ball screws on the column with 100 mm l 3.94"diameter and a hydraulic cylinder for compensation of weight of the headstock. The headstock is on 6 box ways with 2 linear guide ways on the left side to provide rigid and precise positioning. Another advantage is that the linear movement is performed on Hydrostatic ways. The spread of one guide way is 450 mm l 17.71" which allows substantial support and rigidity for the machine. Fully integrated modular designs let our customers adapt their machine to their needs, including X-travel from 2 400 mm to 28 100 mm l 3.94"l 94.29" -1 106", Y-axis travel from 2 000 mm to 8 000 mm l 78.74"-314.96", all variations of this model are available with a variety of attachments, tables and floor plates. Is it not impressive?